Arad Copeland (1805-1884) came with his family from Guilford, Vermont to the Sacandaga Valley in 1815, first settling in the Town of Day. In 1828 Arad and his brother Leonard moved to the Town of Edinburgh, purchasing Ely Beecher’s sawmill and carriage factory located along Beecher Creek. Arad married Anna Elizabeth Trowbridge, daughter of Edinburgh resident Willard Trowbridge.The Trowbridges’ operated a brick kiln behind their home on what is now Sinclaire road. As a wedding gift Willard donated the bricks for a house and Arad built the home for his bride c.1832. The house still stands today across the road from the covered bridge. 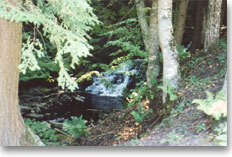 Arad had 35 acres across Beecher Creek where he had garden and pasture land. An open bridge below the house gave access to this acreage until it was destroyed by melting spring snow and ice. In 1879 he then decided to build the covered bridge that still stands today. According to family legend local residents Melzor Manning laid the stones, Jacob Latcher hewed the timbers and Azariah Ellithorpe Jr. framed the bridge. Over the years the bridge received a new metal roof, new flooring and some side boards were replaced. The bridge is 35 feet long and is New York State’s only queenpost truss. A popular tourist attraction the bridge has been photographed from all angles, painted by visiting artists and even played host to a few wedding ceremonies. The only covered bridge left in Saratoga county it has always been used for animal and pedestrian traffic. Beecher’s Hollow extends from the Edinburg 4-corners to the Edinburg Marina—about three quarters of a mile. Many of these buildings in the hollow are much the same as when Arad lived and raised his family. This beautiful old bridge that Arad built to get his cows safely to pasture had remained in the Copeland family until the fall of 1997 when great, great grandson Robert Tyrrell and his wife Betty graciously deeded the bridge over to the Edinburg Historical Society.This will guarantee that the bridge will continue to receive the same love and care that it’s received for over 120 years. The Historical Society has received several grants and has waged an aggressive campaign selling “shares” on the covered bridge to raise money. In partnership with the town, complete restoration of the bridge and 90% of site improvements were done in 2000 and 2001. Remaining site work will be completed this year(2003). A re-dedication celebration of the bridge was held on a beautiful June day in 2002 opening the site officially to the public. 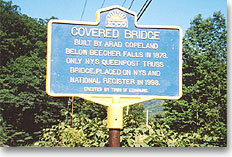 Thanks to a committee from the New York State Covered Bridge Society the bridge was placed on the State and National Registers of Historic Sites in 1998. Once you’ve visited the covered bridge and viewed the falls above it you’ll always have a special place in your heart for this piece of Edinburgh’s history.